Scotsman Russell Knox says he is "very optimistic" about his chances of making his Ryder Cup debut for Europe against the United States in September. The US-based 30-year-old is currently 17th on the world points list and 32nd on the European points list after rising to a career-best ranking of 23. "I feel like if I keep playing the way I am, I should make it," Knox said. "It is the best of the best that make the team, so you really have to deserve it and earn it. Hopefully I can." Knox finished joint-second to Rory McIlroy at last week's Irish Open, having also finished runner-up at the OHL Classic in mid-November and the RBC Heritage last month on the PGA Tour in America. He won his first tour title by winning the WGC-HSBC Champions event in Shanghai in November. Inverness-born Knox will make his debut at the BMW PGA Championship on Thursday, an event he chose ahead of one of his favourite PGA Tour events at the Colonial in Texas this week in order to further his ambition of teeing it up for Europe at Hazeltine, Minnesota, from 30 September to 2 October. 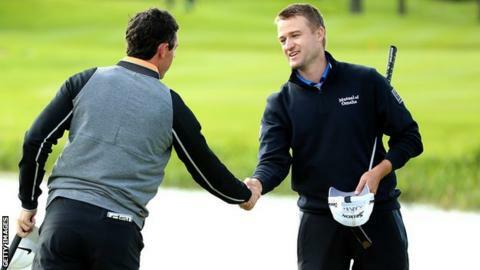 "After my win in China I gladly joined the European Tour to get a push for the Ryder Cup team," he said. "I got off to a slow start this year and wasn't playing that well. But recently I have been in great form, and had a couple of great chances to win, so I am very optimistic about my chances. "If I play good enough, I will be in the team. If I don't, I don't deserve to be in it." Knox has been trying out new drivers at Wentworth this week after his old one bit the dust during his first round at the Irish Open. "I hit my drive on the 12th or 13th hole and the face cracked," he recalled. "I'd used that one for three-and-a-half years so it was a sad moment in my life. "My buddie David Lingmerth came to my rescue and I used his driver for the next three days. "I have been giving it a whack here with three or four to choose from, but I think I've found one that is halfway decent, so it should be good. "I remember watching 'Monty' [Colin Montgomerie] dominating at Wentworth (the Scot won three years in a row, from 1998-2000) - pin-high, every iron shot. "I really strive to be as accurate and dialled-in as he was over the years."